It's a cliche, but when I was asked if I'd like to review a copy of Ellen Ecker Ogden's newest cookbook The Complete Kitchen Garden, I of course sprang at the chance. And even though I live in NYC, with no real hope of a garden approximating anything like the ones laid out in the book, I am a pretty big fan of armchair traveling. Or in this case, armchair gardening. And anyway, although filled with pictures and diagrams that will help you recreate any one of the fourteen gardens highlighted, the book is also filled with recipes to use up all of that bounty. So if you don't have a garden, but you do have a farmers market, there's still plenty in here for you. I will also mention that it was mid-February when I was deciding what to try, and I still dogeared at least 30 recipes. Those are just the ones I thought I could get away with during the black-hole of produce that is mid-winter. It won't be surprising that kitchen gardens have a long history. Ogden traces the first documented ones to ancient Persia, when cultivated gardens both bore food and served as a space for entertaining and respite. Just like food itself, you can think of the kitchen garden as merely providing sustenance, or you can cultivate a living, breathing work of art. Looking through the book, you wouldn't be surprised to read that Ogden is herself an artist. Before delineating her ideas for different kinds of gardens, Ogden offers tips on how to get started, how to deal with soil, compost and seeds. She talks about what tools you'll need, what embellishments you may want, and things to consider when deciding on the theme of your garden. Speaking of the gardens, there's the Salad Lover's Garden, filled with arugula, chervil, claytonia, sorrel, mache and eight other varieties. Ogden prefers the unusual to the standard, since basic Boston lettuce, for example, can be easily purchased. There's also the Children's Garden, the Heirloom Maze Garden, the Artist's Garden and the Culinary Herb Garden, just for example. Each garden, aside from suggestions for what to grow, features a floor-plan of sorts for organizing the plants. Some rely on rows, some on the Greek cross, some are shaped like diamonds with a border. 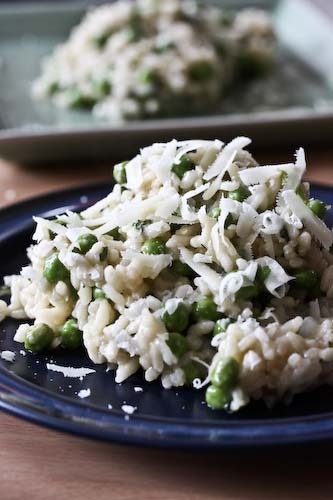 I'm going to share two recipes from the book with you, one now and one in a couple of days along with a brief interview I had with the author. First things. This Baked-Salmon in Phyllo with Tomato-Ginger Filling comes from the Paint Box Garden, which features beds of plants growing in raised beds. The fennel would have come from this garden rather than from the local market. It's a perfect dish for a dinner party, since the packets can me made up ahead and then baked just before serving. My sister was visiting when I made this dish, and I'm pretty certain that her enthusiasm had nothing to do with my feelings. These are delicious, beautiful, unexpected and healthy. In a small bowl, combine the tomatoes, ginger, lime zest and juice and fennel. Season with salt and pepper. Position a rack in the center of the oven and preheat to 450F. Brush the tops of the envelopes with reserved melted butter. Bake until the phyllo is golden brown, 12-15 minutes. Serve hot with a dab of hollandaise as a special treat, or serve cold, with a bit of homemade herbed mayonnaise or aioli. 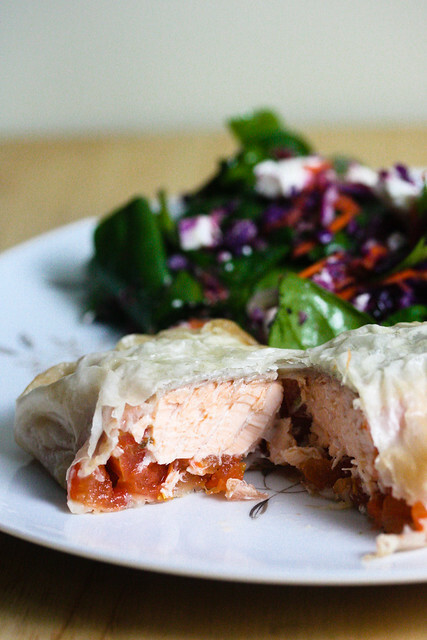 I love Salmon and the additional of the tomato-ginger filling inside the Phyllo really made this dish wonderful. Certainly something I will be making gain! 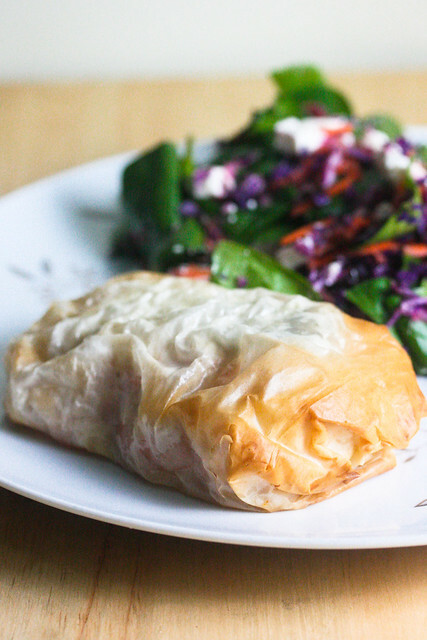 Boy oh boy, I wish I saw phyllo wrapping more often-- it makes anything amazing. I've bookmarked this recipe and can't wait to try the ginger mixed in. Delicious photography, as usual, Andrea! I WANT this book!! You can tell the author is an artist from the colors of the food. Can't wait to present this dish to friends! i love salmon and this recipe is one of the best salmon dish! I made this recipe for dinner last night for my family. It was easy to prepare and came out really flavorful. I didn't have any fennel fronds (i was too lazy to go to the market) so I used fennel seeds...(??) i'm sure it changes this recipe but all in all it was a hit for my family. Next time I will have to get the fennel fronds just so I know how this recipe tastes, for real this time. Lol.